to prevent air swirling with the casting metal. achieve a high casting quality and contour reproduction. The required mold filling times for die casting may be very short so that high flow and plunger velocities are required in the mold filling phase (2nd phase). For this reason, die casting requires at least a two-phase control for the casting drive. In the first phase, the casting metal is accumulated to the changeover point at low velocity. On reaching the changeover point, the plunger is accelerated to the velocity required for mold filling. The high velocity range is referred to as 2nd phase or mold filling phase. In this phase, the actual mold cavity is filled with the liquid metal (fig. 2). A two-phase control includes the slow shot phase and quick mold filling (with changeover from v1 to v2 at the changeover point) and with subsequent influence of the resulting end pressure (only the available accumulator pressure acts for final compression of the casting, see Casting pressure) on the filled mold cavity. Depending on the required conditions of the respective casting, the changeover point can be adjusted and is a significant quality criterion that is to be monitored. Particularly for horizontal cold chamber machines, the changeover point has to be first coordinated with the filling level as the shot sleeve is only partly filled before startup. The lower the filling level the more air has to be discharged via the joints and mold parting plane during the slow shot phase. For this reason, it is generally useful to aim for a maximum initial filling level that cannot always be achieved in practice. Depending on the machine model and shape (construction height of the fixed plate, casting stroke, mold height, sprue pin, required clearances for metal feed etc. ), restrictions in length of the shot sleeve occur. In practice, high initial filling levels cannot always be achieved by shortening the shot sleeve and/or by using a smaller plunger diameter. This kind of measures may not always be useful. In general, the possibility of using a higher dosing exists. However, it also results in thicker casting residues with subsequent reduction of the cycle time (longer casting residuecooling time) or unnecessarily high thermal stress (see Thermal balance) and increases the costs of the casting as the material costs increase. One method to prevent air swirling in the runner and to define the changeover point is to calculate the path point at which the metal is accumulated directly up to the gate. 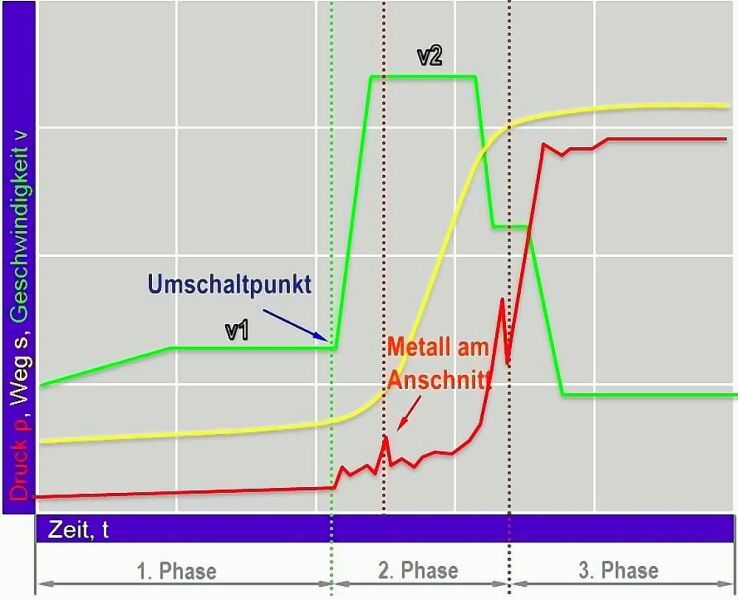 Due to dosing fluctuations at standard dosing furnaces or dosing devices, the exact path point is difficult to determine in practice. A possible remedy for this is the use of metal front contact sensors which are directly installed in the runner in front of the gate to ensure exact changeover independent of dosing fluctuations, if they are coupled with the control of the machine. Often, however, multiple gates are available that are not always installed at the same height. Respectively, the best changeover point to ensure the casting quality is to be defined by non-destructive testing. Due to inertia, the acceleration the driven mass - melt, plunger, plunger rod, etc. - cannot be directly applied by the casting drive and requires time. For this reason, it may be favorable to select the changeover point shortly after the metal accumulation, i.e. shortly after reaching a filling level of 100 %. At this time, the flow peak should not yet have reached the mold cavity. For thick-walled and high-volume parts, priming at slow velocities may also support the casting quality, i.e. the changeover point is already set when the mold cavity is partly filled. This process is very common as it reduces the required final compression volume. 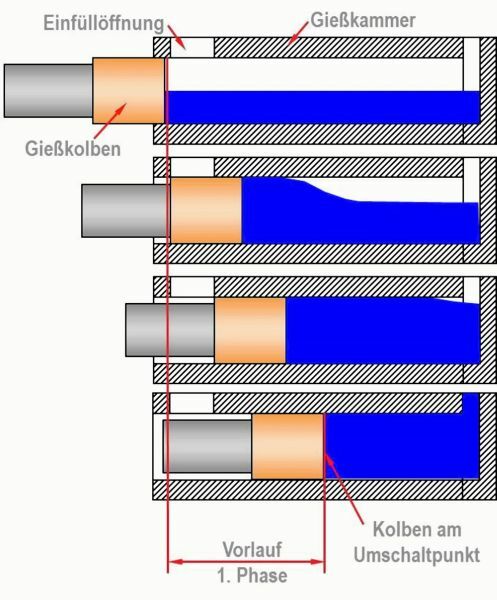 In any case, interpretation of the results of a mold filling simulation (see Solidification simulation) is recommended as it returns the conditions at time of changeover very accurate and realistic. The changeover point defines the duration of the 1st phase. On changeover, all moveable parts have to be accelerated. This requires a defined stroke as well as time and force. For this reason, the changeover point lies within the range of the runner filling. Correct changeover requires high dosing accuracy! A roll over wave may occur in the shot sleeve and there is a risk of increased air pockets.